The fears are many. Yet, once we move closer to classical music, we realise we are scared of a monster in our heads. “Nothing in life is to be feared. It is only to be understood,” said Marie Sklodowska-Curie, Polish physicist and chemist who won the Nobel Prize twice. Taking this into account, we may look into the many achievements of classical music in Egypt in 2015 and become more welcoming in the upcoming months. We can use this opportunity to understand the benign face of classical music and bring to light its often overlooked omnipresence in our cultural background. It is a time for assessing what classical music has achieved in Egypt’s 2015, how work in this department managed to bring us closer to a marvelous experience and, above all, how it tore down many real and imagined barriers we ourselves erect between us and the music. But, before moving to the 2015 review, let’s point to a conceptual element of the subject matter, one that was successfully challenged throughout the year, and which is linked to our relation with the term “classical”. In other words, the terrifying word “classical” is the monster that disconnects many contemporary minds from music made, let’s face it, by composers who are no longer with us. Yet regardless of the seemingly daunting terminology, the moment we realise how present this music is in our life, we might change our mind about the monster. One of 2015’s achievements is that it started challenging, in a variety of ways, the preconceptions we have about classical music. No doubt, due to cultural and historical background, European and American listeners probably relate more easily to classical music. However, Egypt’s history reveals many connections, interactions and practices which, starting with the famed Khedival Opera House and coming all the way forward to today’s institutions and ensembles, have continuously cherished the legacy. Moreover, not only do countless animated films as well as American and European cinema include a lot of classical compositions in their scores, the Egypt cinema’s golden age – whose fruits are cherished by people from all cultural backgrounds and generations – are also infused with Western classical compositions, from Rimsky-Korsakov’s Scheherazade to excerpts from the concertos or symphonies by Alexander Borodin, Pyotr Ilyich Tchaikovsky and many others. At the same time, the fraction of population who visit the concert halls occasionally is usually lured by specific events: Vivaldi’s Four Seasons, Mozart’s 40th Symphony, Beethoven’s 5th Symphony, Verdi’s Aida, Mikis Theodorakis’s Zorba ballet... Even if the English-speaking Egyptian reader of this article is not acquainted with the Western classical music, the aforementioned examples and compositions will definitely ring a bell, thus prooving their connection with the genre. It is also a remarkable that, in a country with over 90 million citizens, where many cultural traditions are admired by different communities, Western classical music has nonetheless taken root. Egypt’s music history boasts many a thriving episode, flourishing epochs; it also includes many difficult times when music was challenged. Among the pinnacles of the sine curve are the 1950s-1960s, which were followed by the less fortunate 1970s, marked by the burning of the Khedivial Opera House in 1971. We had to wait until 1988 and the New Opera to experience the series of revivals. Yet, as the years and decades passed, the sine curve was challenged again by many factors, be they social, political or economic. It seems that, after the past decade, during which the classical music moved back to the lowest point of the curve, 2015 indicates that the winds of change might have started blowing again, hopefully moving us towards yet another pinnacle. Since Ines Abdel Dayem became the Cairo Opera House chairperson in February 2012, the institution began implementing a new policy that moved it closer to its core mission of a National Cultural Centre. “During her tenure, she opened up the opera halls to many Egyptian artists, bringing in the independent scene, and invited the foreign embassies and cultural centres to hold their performances within the opera walls. Abdel-Dayem’s policies seemed to infuse the Opera halls with energy despite the budget limitations that followed the 2011 revolution,” I wrote in an interview with Abdel-Dayem published in August 2013. Abdel-Dayem’s tenure at the Cairo Opera House was abruptly terminated on 28 May 2013 by former culture minister Alaa Abdel-Aziz, one in a series of sackings in the cultural establishment which led to strikes, protests and resignations by key figures. Briefly, since Abdel-Dayem’s reinstatement in July of the same year by the next minister, Mohamed Saber Arab, and the change in the whole country’s political map, the Cairo Opera House became even more dynamic. “Any artist doing something valuable will find the Cairo Opera doors open. We are here to support all talents that might have nowhere else in the country,” Abdel-Dayem said in the same interview. This mission is being implemented through a large assortment of performances, from classical music – weekly symphonic concerts, frequent chamber music and recitals, galas, concerts for special occasions, operas and ballets – to events with Arabic music, independent musicians, jazz and Latin as well as contemporary dance and film screenings. Even if Western classical music becomes only one of the many art forms practiced by the National Cultural Centre, the abundance of events across stages in Cairo, Alexandria and Damanhour creates a a buzz that directs the audience’s eyes to the many offerings of classical music. This has been helped along by the greater efforts on social media and banners announcing events at the entrance to the Cairo Opera House grounds. As a result, we notice that the number of audiences has gradually increased over the past two years, with galas, special events, opera and ballet performances being the biggest audience magnets. This was also the case during two specific performances that premiered this year, which were probably the most significant successes of the Cairo Opera Company and the Cairo Opera Ballet Company: Verdi’s Il Trovatore, and Ballet Coppélia. 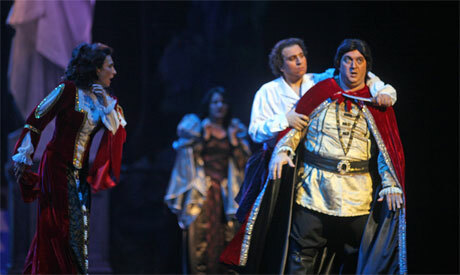 “The mere fact that the Cairo Opera Company decided to perform Verdi’s masterpiece deserves applause. Though, of Verdi’s works, Aida is the recurrent performance in Egypt, often staged more than once in a season, Il Trovatore had not been approached since 1988 when it was staged by a foreign orchestra and choir with soloists from Sofia, Bulgaria. Thus the Opera not only returns after a very long hiatus, it also relies to a much larger extent on Egyptian artists. On 14 May, the curtain opened to the performance by soloists from the Cairo Opera Company and guest singers, with the Cairo Opera Orchestra and the Cairo Opera Choir conducted by David Crescenzi. Performed on four consecutive evenings with two casts of soloists, the opera was directed by Hisham El-Tally. The overall effort, integrity and the sheer artistic sincerity poured into the opera makes it an important and commendable production,” I wrote in a review published in May. 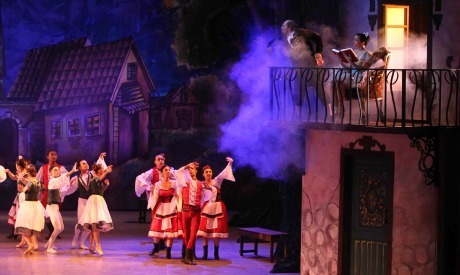 Equally captivating was the work of the Cairo Opera Ballet Company and Cairo Opera Orchestra conducted by Sherif Mohie Eldin, which in October performed Léo Delibes’s Ballet Coppélia. The ballet was materialized on stage by Romanian choreographer Valentine Bartes, Italian costume designer Gianluco Saitto, scenographer Mohamed El-Gharabawy and artistic director Erminia Kamel. Staged for the very first time in the history of the Cairo Opera Ballet Company, Coppélia has definitely engraved itself as one of the most important and masterfully executed works in the troupe’s recent history. As to the symphonic year 2015, it did not lack important events, many of which were a continuation of strategies implemented by Ahmed El-Saedi, the principal conductor and music director of the Cairo Symphony Orchestra at the start of his tenure, from September 2014. Apart from the presentation of a large repertoire, El-Saedi created numerous series of concerts aimed at presenting the works of one composer such as Beethoven or Brahms, and topping with the Great Concertos Series, which introduced captivating compositions: Ravel’s Piano Concerto for the Left Hand in D Major, Tchaikovsky’s Pezzo Capriccioso for Cello and Orchestra in B Minor and Tchaikovsky’s Concerto for Violin and Orchestra in D Major Op. 35, among others. Children’s series of concerts brought schools to the concert hall, presenting them with several compositions including Prokofiev’s Peter and the Wolf and Saint-Saens’s Carnival des Animaux. El-Saedi also pays attention to anniversaries. Several concerts dedicated to the music of Jean Sibelius (1865–1957) marked the composer’s 150th birthday. The Cairo Symphony Orchestra also celebrated Carl Nielsen’s 150th anniversary (in May) and Bohuslav Martinu’s 125th (in December), and the orchestra’s off-spring, the Cairo Symphony Chamber Orchestra, marked J. S. Bach’s and Handel’s 330th anniversaries (March). But it woud take too much space to list all the programmes – suffice to say that the repertoire helped each listener to find something for themself, demonstrating Tobias’s belief that each one of us might like something different. Looking to the Mediterranean coast, on the other hand, we find the Bibliotheca Alexandrina’s (BA) Arts Centre. 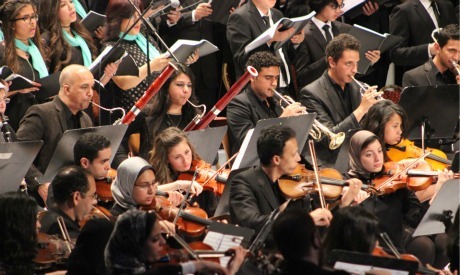 Starting in mid-2014, under the directorship of composer and conductor Hisham Gabr, the Arts Centre has managed to attract a large audience to its halls. On the one hand this was done by creating a strong commotion across the many art genres, on the other hand the programming strategies aim at productions that excel in artistic quality. Stepping into the game extremely fast, the Arts Centre aimed high, bringing the unprecedented results in a very short time. In terms of classical music, the BA Arts Centre has been cultivating this art form for several years now, during which time it made many achievements though it also went through periods of stagnation resulting from post-revolutionary managerial instability. It was 2015 that saw the Art Centre’s resurgence on both the artistic and outreach levels. Alongside establishing a proper classical music season in 2014-2015 and 2015-2016, Gabr brought back a sense of artistic continuity, opening the doors to further development. This is enhanced by the ongoing expansion of ensembles performing classical music. 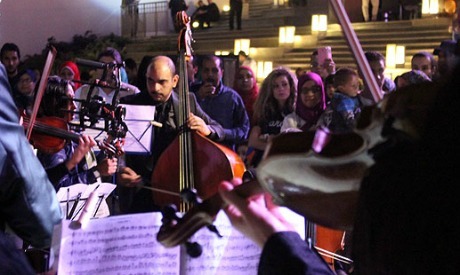 Prior to 2015, the Bibliotheca Alexandrina Chamber Orchestra comprised 16 musicians, all strings. Gabr held auditions and added wind and percussion, giving the orchestra the ability to perform a much wider repertoire. Equally, the Bibliotheca Alexandrina Choir, which in the post-revolution years was completely dissolved, has now been revived and enlarged to 80 members headed by choir master Rodica Ocheseanu. One of the most significant fruits of this artistic expansion took place on 25 April, when a 150-musician ensemble – including the BA Orchestra and the BA Choir joined by the Heaven Harp Choir, alongside four soloists – performed Mozart’s Requiem to a 1,200-strong audience filling the Bibliotheca’s great hall. The evening brought together listeners from many generations and cultural backgrounds. The same event was repeated on 26 April at Cairo’s All Saints’ Cathedral to a 1,000-strong audience. Since this memorable concert, classical music has thrived within the Bibliotheca’s walls. Each concert, whether a chamber music performance, a recital or a special occasion, continues to attract a large numbers of the listeners. The expanded ensembles and even bigger ambitions and plans in the making have seen Gabr inviting international soloists and conductors to the Arts Centre. To top these developments, in October the Arts Centre introduced the Metropolitan Opera’s high definition live transmissions from New York. Initiated by the Metropolitan Opera in 2005, today the international transmission reach over 70 countries around the globe. Egypt joined the network in 2010, with Met concerts screened at the Cairo Opera and the Red Sea El-Gouna resort. With the Bibliotheca Alexandrina taking part in the network, Alexandria’s audiences have the opportunity to enjoy the world-renowned opera’s gems in their city. Artistic programming developments would not suffice if they did not have a strong promotional backbone. Apart from the social media and banners inside and surrounding the Bibliotheca Alexandrina, the Arts Centre advertises its events across the whole of Alexandria. Billboards as well as posters and flyers distributed across the city have contributed to bringing audiences to the events. This is naturally accompanied by the aforementioned commotion which in itself generates the listeners’ interest and boosts word-of-mouth promotion, which reaches beyond the Mediterranean Pearl, often attracting attendees from other cities. Beyond the concert halls, 2015 was an important year in terms of creative outreach. Last October, the Arabic Al-Ahram reported that the Cairo Opera House signed a protocol with Cairo University to bring selected concerts to the latter institution. With this step, the Cairo Opera reinvigorates a strategy which, though it had been practiced in the past, had stopped for over a decade. Outreach is also one of the major concerns of several other institutions and ensembles. In this context, in its sixth season, the El Sakia String Orchestra conducted by its founder Mohamed Saad Basha is one of the important voices promoting classical music through El-Sawy Culturewheel (El Sakia), a centre that offers mainly pop, rock metal etc, concerts to young audiences. The orchestra invites many soloists to join the concerts, creating themes that can be attractive to target listeners. In the past two years, the orchestra has also given concerts outside El Sakia, at various venues including the Nile University located on the southern outskirts of the city. 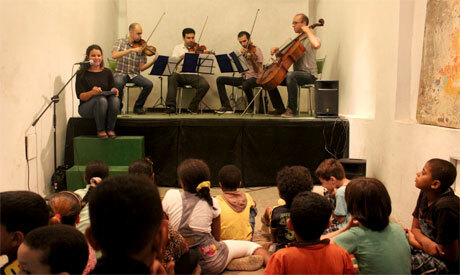 However, this year, special mention in the outreach department should go to the Awtar Quartet (Yasser Ghoneim on first violin, Khaled Saleh on second violin, Essam Abdel-Hamid on viola and Mohamed Abdel-Fattah on cello), for their efforts to bring classical music to previously unexplored locations and their recent focus on the youngest listeners. This year, I featured this extremely dynamic more than once, after their performance at the Alrab3 Cultural Centre in Fatimid Cairo, and later in September after their performance in the series of “Music and Animal Stories for Kids,” which premiered at Artellewa, a cultural centre operating at the heart of the underprivileged neighbourhood of Ard El-Lewa. But the four musicians continue to surprise us with their ability to reinvent themselves again and again. The Artellewa experience was repeated at the Tawasol School in Stabl Antar, a Cairo slum, and later on more concerts took place at the Children’s Cancer Hospital, in Hadayek Helwan (in collaboration with the Hadayek Helwan Algamila Association) and at the Mowaheden Village for orphans in Abu Qir, Alexandria (the latter event organised by BA Arts Centre). Most recently, the quartet participated in the celebration of the 70th anniversary of the Swedish children’s book Pippi Longstocking with an event supported and organised by the Swedish Embassy in Cairo and Safarni. Not only does the Awtar Quartet reach out to communities which otherwise would not even be interested in exploring this genre of music, it also creates an artistic formula accessible to those communities and their children. Their intelligent choice of material and its adaptation allows them to forge an active communication with the young recipients of their art, instilling in them many important values. But it would not be fair to close this assessment of the year, without recognizing many other efforts exerted by numerous institutions and ensembles which either challenged the fears associated with classical music or simply contributed to the classical music scene with interesting concerts. Here too there were many achievements. This year the fifth edition of the Chopin Piano Competition Egypt which took place in November turned international, inviting young pianists from outside Egypt. The European-Egyptian Contemporary Music Society left its regular imprint on the scene, aiming at bringing contemporary music closer to the listeners. The year also included contributions by the Cairo Celebration Choir, whose performance of Mozart’s Great Mass in C was “a step forward and a new chapter in the ensemble’s professional capabilities” as Nayer Nagui, the choir’s founder and artistic director, put it. The Medieval and Renaissance music for voices was an experience offered by The Lions of Cairo under the directorship of John Baboukis and presented at the American University in Cairo (AUC). As per their annual practice, the Cairo Choral Society and the Cairo Festival Orchestra added their share to the scene in May (with Zoltan Kodaly’s Missa Brevis and Benjamin Britten’s Hymn to the Virgin) and in December joined the Christmas season, performing Haydn’s Lord Nelson Mass and Symphony No. 82, “The Bear” at the All Saints’ Cathedral and AUC. 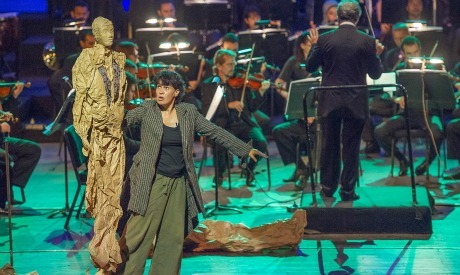 Another contribution to classical music came with Spanish Per Poc Puppet Theatre when in October, the troupe was joined by the Cairo Symphony Chamber Orchestra, the A Cappella Choir, soprano Dalia Farouk and mezzo soprano Amina Khairat to perform the puppet adaptation of Shakespeare’s Midsummer Night’s Dream to Mendelssohn’s music. The Italian Cultural Centre hosted Voces Intimae, hailed as “the best piano trio in the world”, joined by soprano Elisabetta Farris (in May). On the other hand, Egyptian ensembles also witnessed two important contributions to the international classical music scene, both in September. 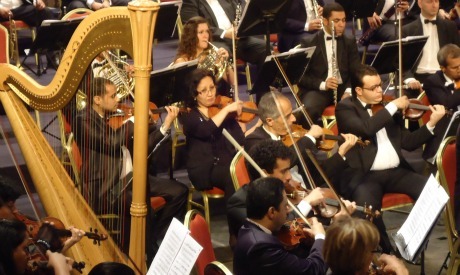 The Cairo Symphony Chamber Orchestra played at Germany’s prestigious Berliner Philharmonic hall and the Bibliotheca Alexandrina Orchestra participated in the International Festival of Classical Music held in Algiers. Listing individual soloists and conductors who were invited to perform on renowned international stages and with celebrated orchestras would take too much space, but it all testifies to the recognized presence of the Egyptian musicians on the international classical music map. On a lighter note, it makes sense to recall the first days of November when, away from the concert halls, the frequenters of Cairo Festival City Mall located in New Cairo were surprised by 40 musicians appearing suddenly in the central courtyard and the balconies overlooking it, performing the first movement of Mozart’s Symphony no. 40. In Egypt, this was the first flash mob that included Western classical music, an experiment which proved successful attracting the attention of many those gathered in the court and its cafes. And, having looked at all the offerings of 2015, we can only raise our eyebrows at how busy the past 12 months were, and how the musicians have contributed to extending the heritage “that belongs to all of us,” as Tobias puts it in the opening quote. It is a year that opened many important doors and addressed many fears. Should the following months and years further develop the foundation laid by 2015, we might be heading towards a transformation on Egypt’s classical music scene.